I savor mornings when I don't have to go to the box because I'm able to take my sweet time eating breakfast. Like today. I fixed myself a plate of scrambled eggs and my leftover almond flour pancakes, which I heated in the toaster. I topped them with coconut butter and coconut nectar. Yuuummm. Now, who says the paleo diet is restricting? 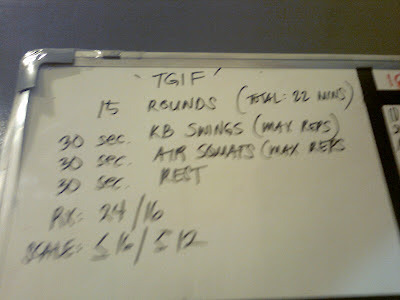 My triceps are still seriously sore from Monday's thruster workout. It wasn't so bad yesterday morning, but the arms progressively got more sore as the day wore on. And this morning, I found it difficult to put on my clothes! But I'm not complaining. Well, maybe a little bit. At least I don't whine about it. Pain? Bring.It.On! I think the coaches are ticking them off the list one by one! I used a 45 lb bar, a 12 kg kettlebell, and an 18" box. My score: 10 rounds + 1 push press. All of us were on the floor after that. Amen. Jack: done and done! Till we meet again! P.S. 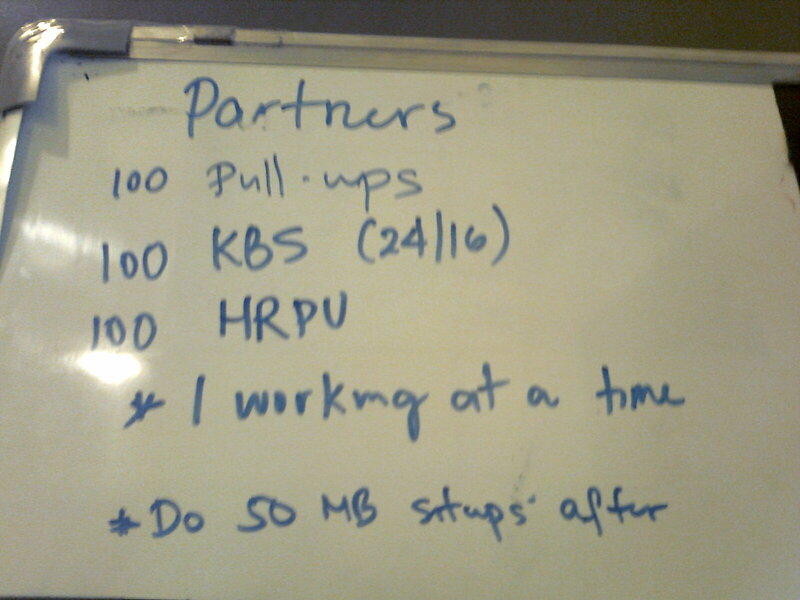 I was able to do 3 pull ups using the blue band today. Yipee! Now I want to work on my dead hang pull ups. The search is over. I finally found the best paleo pancake recipe. I know that paleo pancakes can never be as fluffy as regular ones, but this comes close. Even Nanay (who is anti-paleo because she thinks I'm being too extreme in my diet) and Tatay were surprised that it tasted good. In a medium bowl, mix together the almond flour, baking soda, salt, and cinnamon. You could also sift or whisk them together. The important thing is the dry ingredients are well combined. In a smaller, separate bowl, blend together the eggs, coconut cream, honey, and vanilla. Add the wet ingredients to the dry and mix well. Let rest for 5 mins, then pre-heat your pan over medium heat (I used a non-stick pan). Add about 1/8 cup of batter to the pan. Make sure the pancakes are no bigger than 3" in diameter or you'll have a hard time flipping them. Cook until the surface starts forming a few bubbles and the edges just start to form. Flip and cook the other side. Serve with your choice of toppings. I had mine with butter and coconut nectar. Almond flour is expensive so you'd want to cook every bit of batter in the bowl. You won't regret making this recipe, though! I'd post a photo, but I was so hungry this morning and they're gone now, though I stored some in the freezer. I'll make sure to take photos next time. 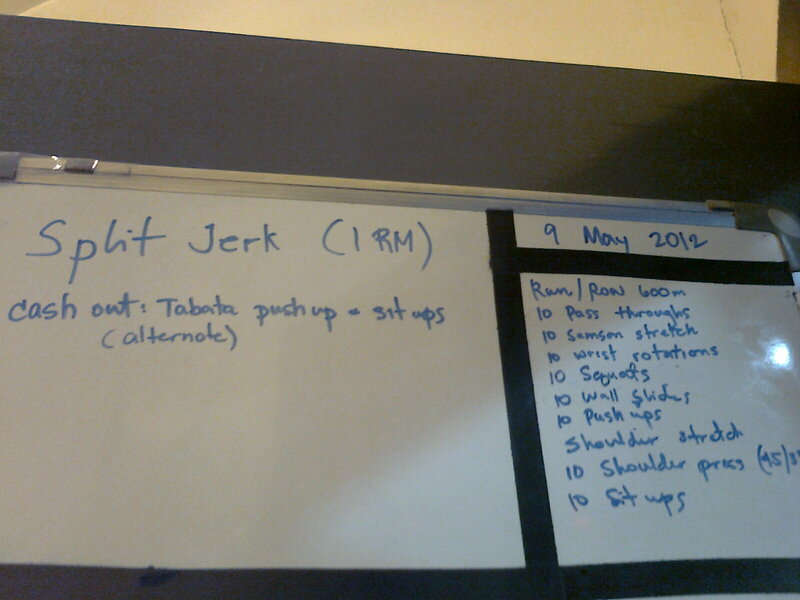 So I got my wish to do a thruster workout. As the website screamed when I checked the WOD: It's bbbeeeennnnnccchhhhmark day! And since it's Memorial Day in the US and you know how CrossFit boxes just love to honor fallen heroes, we paid tribute to Army Sgt. Keith Adam Coe, who died in Iraq of wounds sustained when enemy forces attacked his unit with an explosive device. I tried using a 55 lb bar for the thrusters during warm up and I knew my form would suffer in the early rounds so I went down to 45. 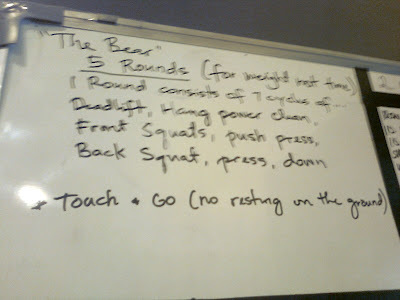 I also attempted to do ring push ups on my knees in the first round but it was like the strength had been drained from my triceps, so I did hand-release push ups instead. Can I tell you a secret? I wanted to quit after the third round. I had to stop many times because I felt like I was dying. As Tere would say, "Sinusundo na ako ng angel ko!" And I can't tell you how utterly relieved and destroyed I was when I finished. 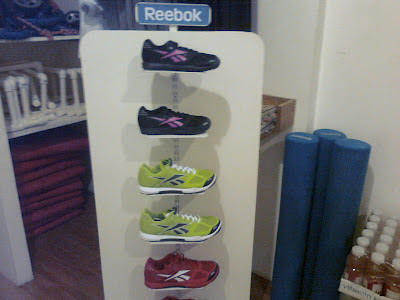 Before we started the workout, the folks from Reebok came and delivered stocks of the Reebok CrossFit Nano 2.0. 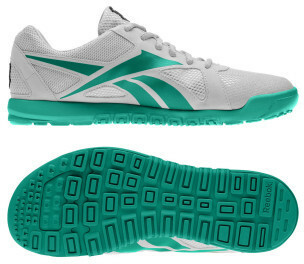 Maybe in the end it's a good thing I didn't like the shoes because I won't feel so bad that I couldn't buy them! We had another fun workout today. Or maybe it was fun because it's Friday and people are in a good mood. I was a little bit disappointed, though, because when I checked the site last night, I could've sworn I read that we were going to do thrusters today. Oh, well. We shall meet again one day soon, thrusters. There were around 10 of us at the 10 am class today so the box was a little crowded. I couldn't find the two pull up bands I'd used during the last WOD so I went back to the green band, but just for today. I also did paralette dips instead of ring dips. 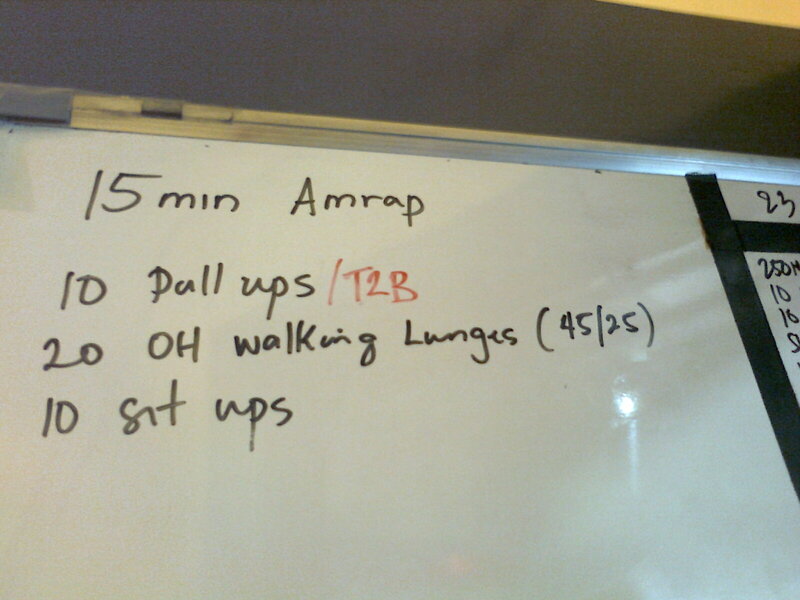 My score: 15 + 5 ring dips. That means I did 225 squats. Good thing my thunder thighs saw me through. I miss lifting. In one of her posts, CrossFit Lisbeth says, "When nothing else seemed to work right, be right, feel right - the barbell felt right. You could swear, stomp, smash, and get all sorts of ugly but the barbell just took it. Took all of it." 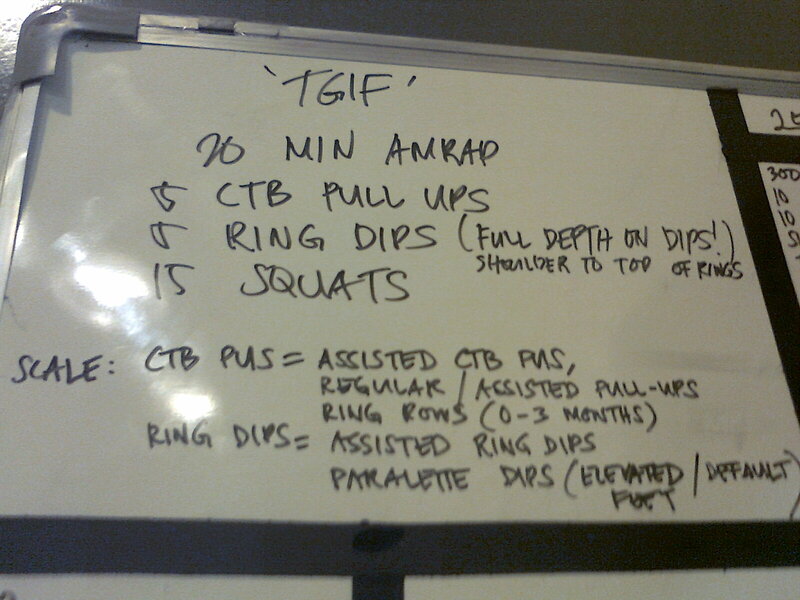 Dear barbell, you never fail to make me feel good. Remember I promised myself that I will try to do workouts as prescribed whenever possible? Well, I got the chance to fulfill that promise today. After days of Jordan encouraging me to move up from the green band when doing pull ups, I finally relented and used 2 thinner bands together (one was purple, the other was a thin black one). It was more challenging than the green band, for sure, but it wasn't that difficult. For the walking lunges, I used a 25 lb plate as prescribed. It was either that or a 15 lb plate, which is too light. So, my score: 6 rounds + 8 pull ups. Not bad. Not bad at all. Although today's workout wasn't that difficult. Definitely not as difficult as Monday's WOD! 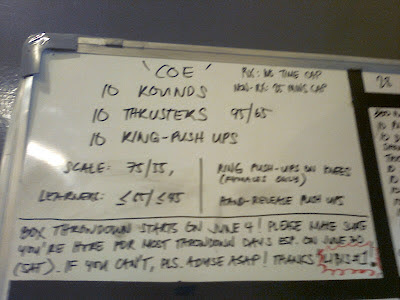 May 21 WOD: Kettlebell swings again?! I got a rip on my left hand from doing the kettlebell swings last Friday. I don't want to be a baby about it but it hurts so much! I couldn't shampoo my hair or put lotion properly because I avoid using that part of my hand. And I remember dreading the WOD because I was afraid of aggravating it. But I still went. When do I ever not go? 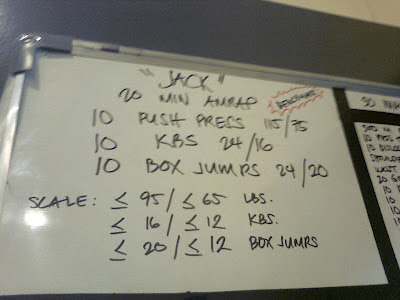 I went for the row, used a 12 kg kettlebell, and an 18" box. Cray-cray! My time: 19:01. 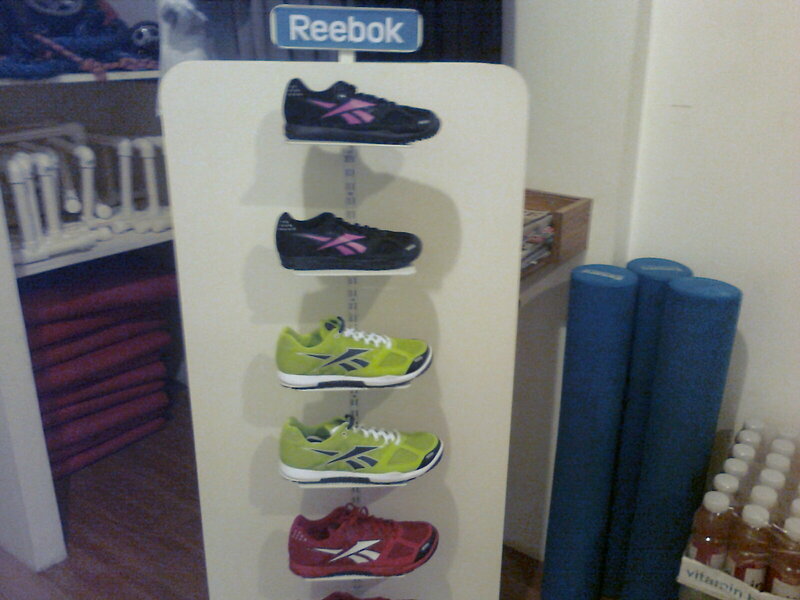 After the workout, Tere and I promised ourselves that from then on, we will try to go Rx whenever possible. We could've done today's workout as Rx'd but we were just too chicken. 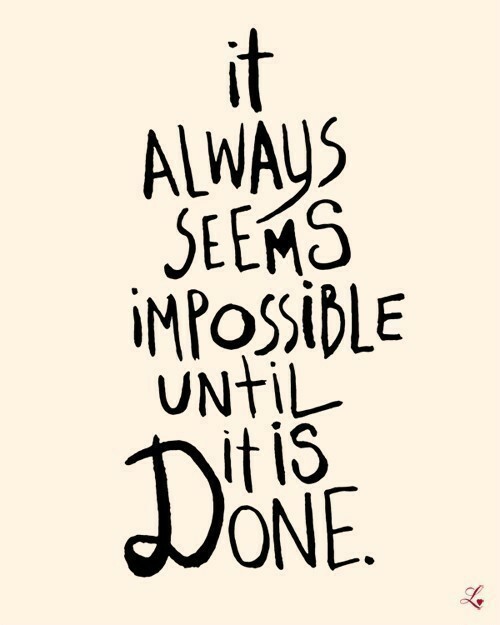 As Jordan would say, it's okay to DNF as long as you're working to get stronger. And how else would we be able to do workouts as Rx'd if we don't do it? Duh. Gotta start somewhere. I really wanted to go to the box yesterday because I saw on the website that the WOD was CrossFit Total. I read up on it and found a simple definition on CrossFit.com. According to Mark Rippetoe, the CrossFit Total reflects an athlete's functional strength capacity more accurately than any other test. It is the sum of the best of three attempts at the squat (back squat), the press (strict, no kipping), and the dead lift. 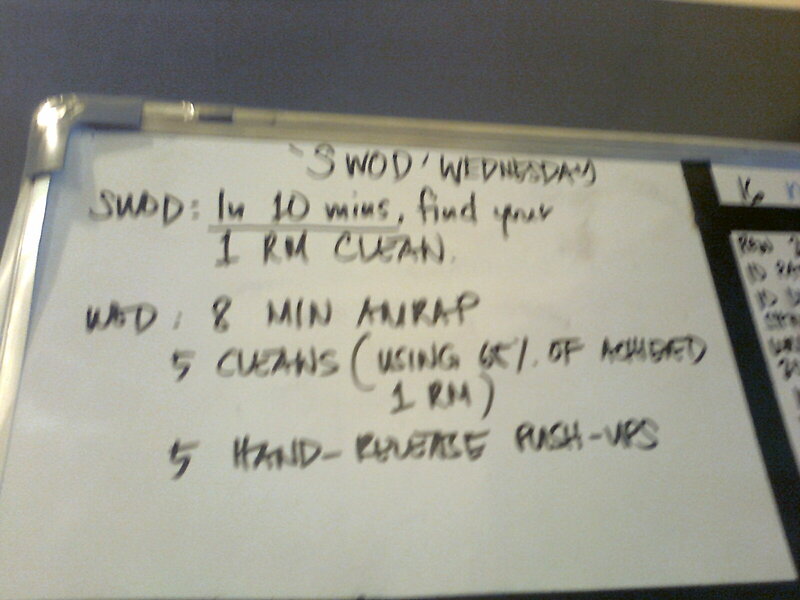 Since I love lifting, I tweeted my request to CrossFit MNL, asking if I could do it today. Coach Pau responded and set the time (9 am), and so I found myself at the box at 8:45 am. Excited! Tere arrived shortly after, then Pau explained how we should warm up. 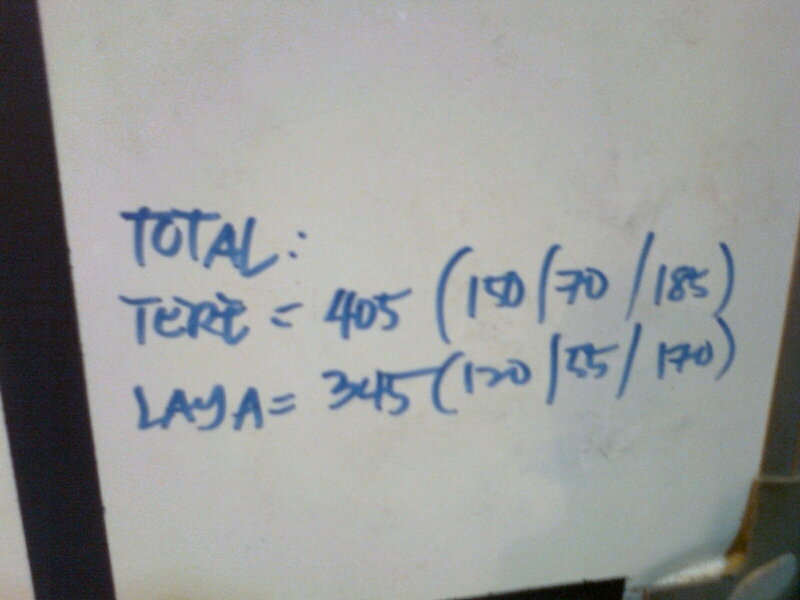 After the warm up, Tere and I went to work. For this one, I don't know how I got to my final score. I just knew that Pau kept adding weight until he told me that I was doing my last attempt. What was going on in my mind? Shins to the bar, tight hams, tight core, chest up, and pull! When I succeeded, he told me that I did 170#. One hundred seventy pounds (yes, I really have to spell that out). I couldn't help squealing and jumping for joy. A PR! Our totals. Look at Tere's score! She's a beast! Rawr. 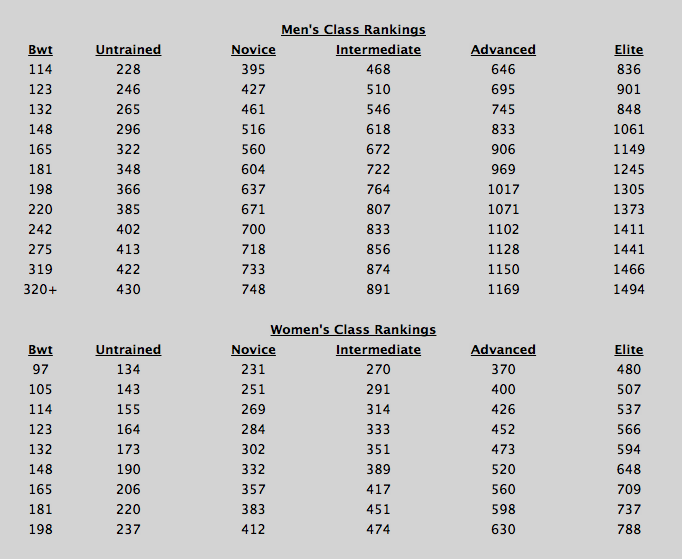 Since my body weight is 112 and my score was 345, that means I'm somewhere in between intermediate and advanced. Heck, yeah! You get your score by adding up all the reps you'd done. My quads were in agony after those 22 mins. To think I only used an 8 kg kettlebell. Anyway, my score: 461. Oh, SWOD Wednesdays, I love you! 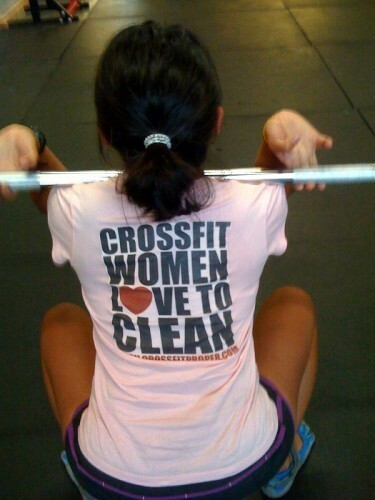 We worked on our cleans today. First, we were given 10 mins to find our 1RM. I started with 55# and worked my way up in 10s until I reached 95#. Whoa. Yes. Ninety five pounds! 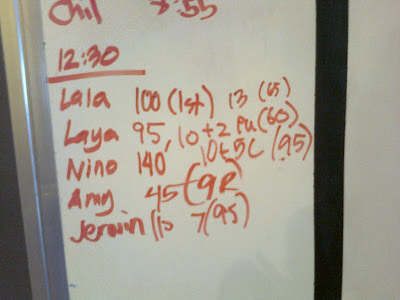 I was surprised and amazed, because the last time we did a strength WOD on cleans, my 1RM was 65#. I almost couldn't believe it. I had to double check the plates I used to make sure that I'd computed correctly. I used a 60# bar for the cleans. I must admit that I was very tempted to use a 55# bar, but then I decided that I should challenge myself. It was becoming a struggle to rack the bar towards the end of the 8 minutes, but I did it. By George, I did it! I still need to work on my form but I'm getting there. My score: 10 + 2 push ups. I'm on vacation the whole week so instead of going to the 10 am class, I attended the 12:30 one. I missed the camaraderie in my "Moms' Class," but the people I worked out with today were also cool. 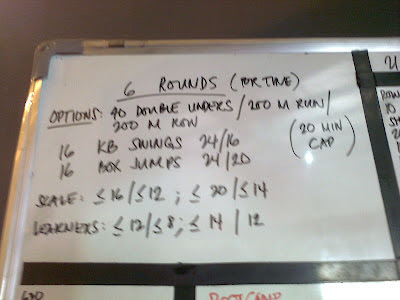 Anyway, on to the WOD called The Seven. I know, it sounds ominous, right? Like the Seven Deadly Sins kind of ominous. Apparently, it's a benchmark workout that was created in honor of seven CIA officers and one Jordanian officer who were killed in Afghanistan in 2009. 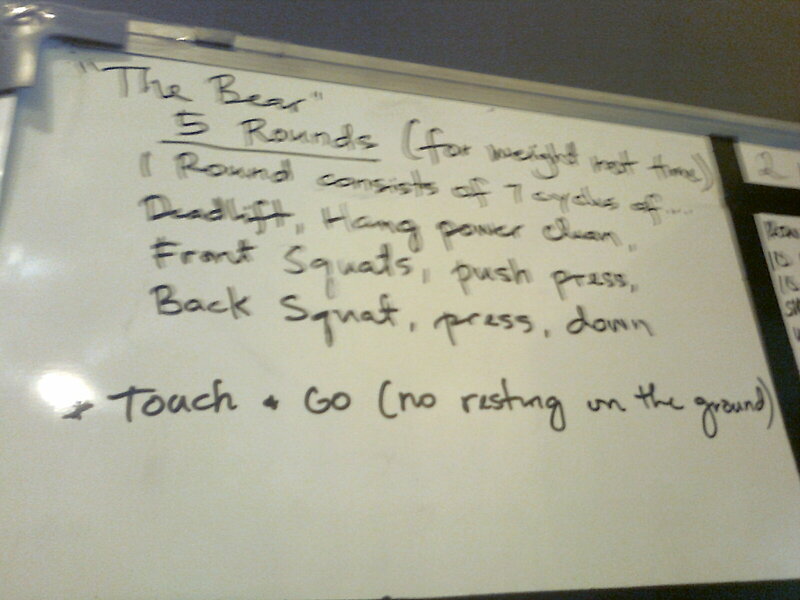 Seven reps for each of the seven exercises, done for seven rounds. Whew! Since I was doing it non-Rx'd, we were given a 25 minute cap. I used a box and did the HSPUs on my knees; used a 45# barbell for the thursters; did knees to chest; used 95# for the dead lifts; used the 12 kg kettlebell for the KBS; and used the green band for the pull ups. 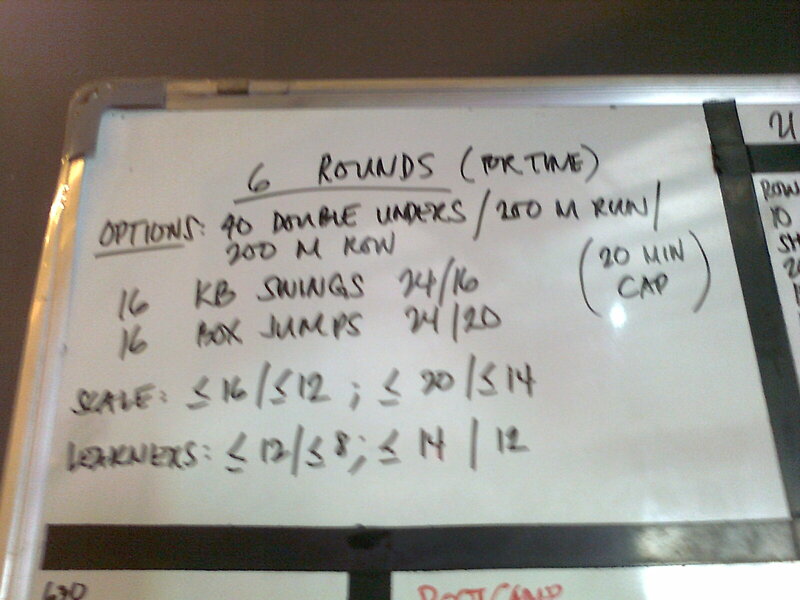 At the end of the 25 mins, I'd done 5 rounds + 3 burpees. It was so hard! Somewhere in between the 4th and the 5th round, I started feeling faint but I willed myself to keep going. I survived! May 11 WOD: TGIF back squats! My scores: 40 reps at 65# and 5:08 mins for the row. Ugh! Halfway through the row my thighs were burning. Burninggg! Only 2 people are supposed to work at the same time, and when one of them gets tired, the third team member subs for her. This continues until the team completes the required number of reps. I hadn't done burpees for the longest time, so that was good. I teamed with Belen and Trisha, and we finished first with 13:25 (I think). It's Wednesday, and we did a strength WOD again today. 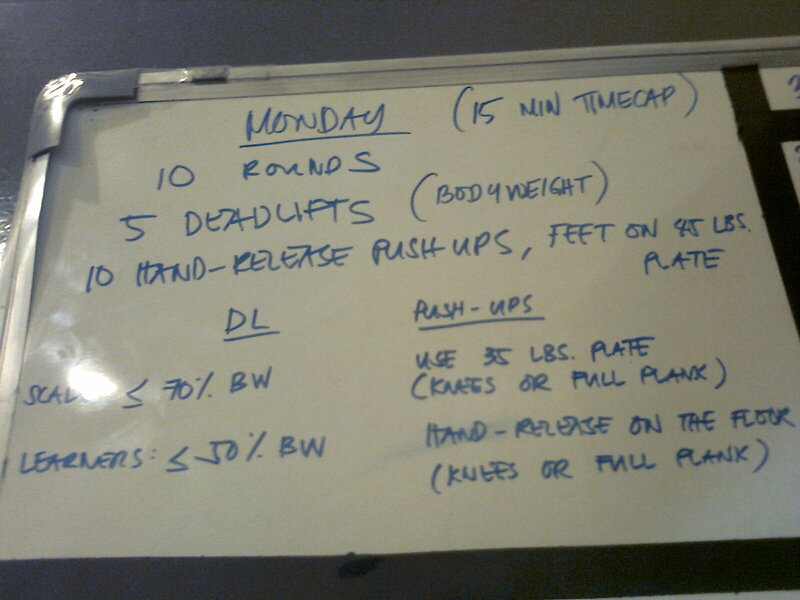 I have to say, since the coaches moved strength day to Wednesdays, I'm starting to love this day of the week. 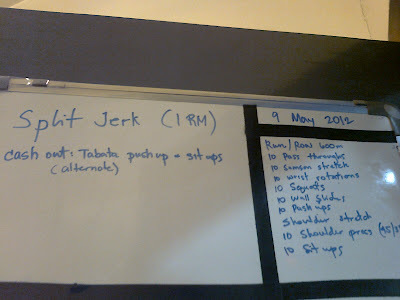 It was my first time to do split jerks. I was nervous because when I looked at the board, the lowest score was 60#. My fear was starting to get the better of me again when I thought about all the shoulder to overhead lifts I'd done, because the maximum was 45 or 55# -- I'm not so sure now. 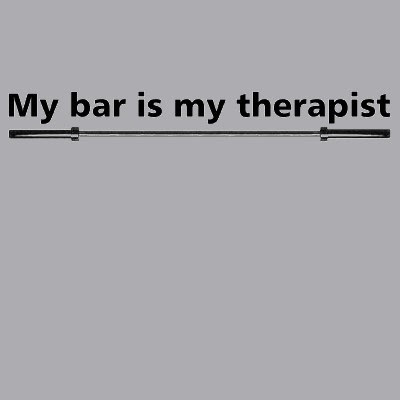 It's a good thing Tere and I were sharing a bar because she gave me the push I needed. 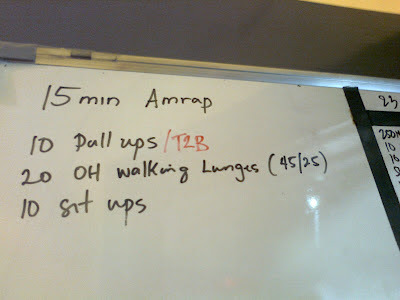 We warmed up with the 35# bar, then worked our way up. Finally, we reached 85#... and I did it! I tried going further up to 95# but I couldn't push it up anymore, and there was a fraction of a second when I was sure the bar was going to hit my head. Good thing I was able to bail or I'm pretty sure it would've been a bloody day at the box. After the SWOD, we did alternate tabata push ups and sit ups. That is, 20 secs push ups, 10 secs rest, 20 sec sit ups, and so on until the end of 8 mins. Overall good day today! The CrossFit Games Asia Regional is over, and although our Coaches Pau and John didn't make it, I'm positive that this is just the beginning of Filipino CrossFitters entering the CF Games scene. Several girls and I at the box were joking that we're going to the Open as a team next year. Yeah, one day. 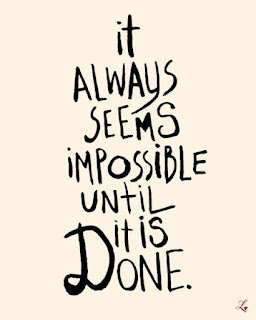 I'm inspired by a co-parent who told me that he started doing CrossFit 5 years ago, when he was 40. And he said he still gets amazed whenever he sets a PR. That's where I wanna be when I'm in my mid-40s. This is a video I saw sometime ago, and although the visuals don't appeal that much to me, it's the voiceover that gives me goosies and makes me tear up (I'm a sap like that). "Here’s the thing that makes life so interesting. The theory of evolution claims only the strong shall survive. Maybe so. Maybe so. But the theory of competition says just because they're the strong doesn’t mean they can't get their asses kicked. That's right. See, what every long-shot, come-from-behind underdog will tell you is this: the other guy may in fact be the favorite. The odds maybe stacked against you, fair enough. But what the odds don’t know is this isn’t a math test. This is a completely different kind of test. One where passion has a funny way of trumping logic. So before you step up to the starting line, before the whistle blows, and the clock starts ticking, just remember out here the results don’t always add up. No matter what the stats may say, and the experts may think, and the commentators may have predicted, when the race is on all bets are off. Don’t be surprised if someone decides to flip the script and take a pass on yelling "Uncle." And then suddenly, as the old saying goes, we got ourselves a game!" I was partnered with Lady, and she kindly volunteered to go at it first. We broke it up by doing 30 reps, then the remaining 20. I used an 8 kg kettlebell while Lady used a 12 kg one (wow!). Our time: 12:45. We were surprised when we looked at the board and saw that the slowest pair in our class (that's us) still did better than the fastest in the morning classes. Anyway, cashout was 50 medicine ball sit ups. I used 10#. And now my biceps hurt. 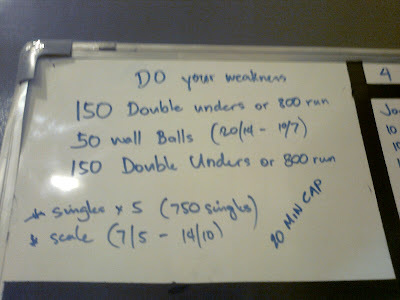 I chose to do the run first, and when I was done with the wall balls I chose to do the 750 single unders. I almost didn't make the 20 min cap! Darn those 750 singles. Halfway through it I was wishing I'd chosen to run instead. Ah well. My time: 19:04. The thing I love most about doing CrossFit is I learn to push myself further every workout. Well, okay, maybe not every workout, but most workouts I'm able to do it. I want to reach that point where I leave everything on the floor, and I walk out of the box feeling like I couldn't have done better because I'd given it my best shot. 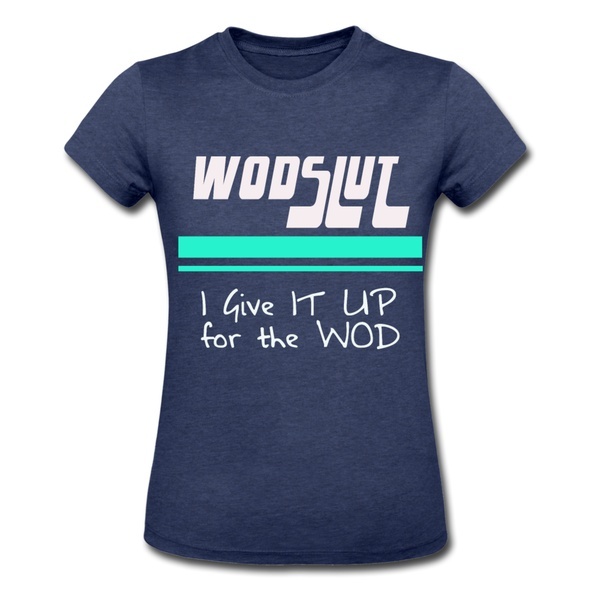 Give it up for the WOD. Every. Time. There is no resting during the set. You cannot put down the bar at all until you're done with the 7 cycles. If you do, it's a fail. However, you can (and probably should) take as long as you want because it's not a timed workout. Darn it was hard!!! I was able to work up to 45# on the 3rd round but I failed on the 6th cycle. So I went down to 40# and used that for the 5th round as well. So that was my final score. I've been wanting a paleo treat that doesn't need a lot of time to prepare (i.e. no baking), and I finally stumbled across these fudge babies by Chocolate-Covered Katie. 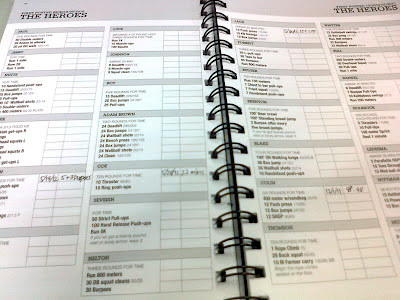 Now, for the longest time, I've avoided making anything with dates. Why? Because we don't have a food processor, and almost all the recipes I've found require the use of it for the dates. But I've had a pack of dates sitting in the fridge for some weeks now, so I thought the fudge babies would be a good recipe to use it in. Chop walnuts very finely, then set aside. Place dates in a shallow dish and sprinkle with some water (about 1 to 2 Tbsp). Microwave on a low setting for about a minute, mash with a fork and sprinkle with more water if needed, then microwave again for about 2 minutes and mash very well using a fork. Transfer to a mixing bowl. Add cocoa, walnuts, and salt to the mashed dates. Use your hands to mix everything together very well, and when everything's mixed, form into 1 to 1.5" balls. Be warned: the mixture will be very sticky but it's so gonna be worth it. Trust me. I Rx'd on the dead lifts (115#) but did the push ups on my knees on a 25# plate. My time: 11:46. Whoa. A lift that I Rx'd!